Akwa United striker Musa Newman, Shedrack Asiegbu of Abia Warriors and the NPFL leading scorer and MFM FC striker Stephen Odey have emerged as the men in the running for the VAT Wonder Goal 6. The three goals were among 18 scored on Matchday 25. 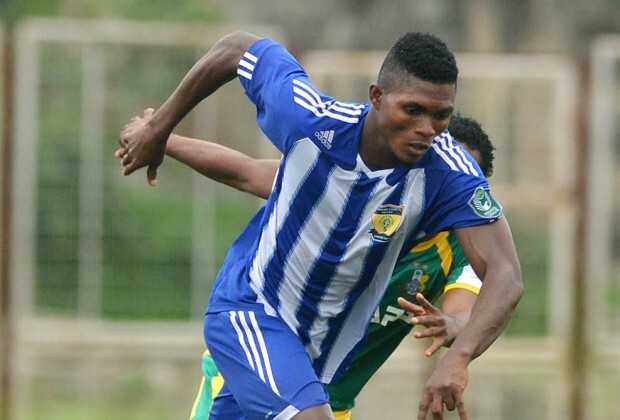 Newman’s goal was Akwa United’s second in a 2-0 win over Katsina United while Asiegbu’s strike was the first of his brace in a tight contest with league leaders Plateau United which his club Abia Warriors triumphed 2-1. The goal scored by Odey for MFM against Kano Pillars temporarily put the game at 1-1 and later represented scant consolation as Pillars ran out 3-1 winners. The build-up to Asiegbu’s goal began with a throw-in on the right channel of Abia Warriors’ attack. Yakub Hammed threw the ball to Sunday Adetunji who shielded it nicely at the edge of Plateau United’s box before cushioning it to Uche Ihuarulam whose intended cross took a deflection off the back of Plateau United’s Jimmy Ambrose. The ball then fell kindly to Asiegbu who controlled with his chest towards his left foot and struck sweetly into the top corner beyond Plateau United goalkeeper Dele Ajiboye for the first of his two goals on the matchday under review. Katsina United’s sloppy defending was a reason that led to Newman’s goal for Akwa United who were at the time leading by a goal at the Godswill Akpabio Stadium, Uyo. Akwa United attacked from the left, Katsina United could not clear their lines and that allowed in a cross into the box which an unmarked Newman directed his headed attempt downward into the net past goalkeeper Okoli Okoli. For the goal scored by Odey, it was a typical MFM style of playing from the back with short passes. Sikiru Olatunbosun and playmaker Chukwuka Onuwa were involved in a brilliant interchange of passes before the former slipped Odey through on goal. The NPFL leading scorer used his pace to good effect, leaving the Kano Pillars’ defence in his wake. He then calmly picked his spot to beat David Obiazo in goal. Voting for the VAT Wonder Goal 6 commences on the NPFL website and Twitter account and will end at midnight ofThursday, July 6, 2017. The VAT Wonder Goal Award attracts a cash prize of N150, 000 for the winner with half of the money donated to a Charity to be nominated by the player within the state where the club is located. It is supported by the Federal Inland Revenue Services (FIRS) to promote club-community relationship and also create awareness for tax education.